One of my favorite Instagram memes goes something like this: “I never understood why we get so dressed up for Thanksgiving and don’t go anywhere…just walking around the kitchen fly as hell”. All I have to say is: YES HONEY, YES! Bring on the fur, sequins and anything else us ladies wanna wear that day. Like this overly obnoxious puffy sleeve blouse, perhaps? You know me; the bigger the sleeve the better! For some reason, a black and white combo like this always reminds me of Thanksgiving. Thinking about it, I wore something similar to this last year. I guess if it aint broke, don’t fix it! 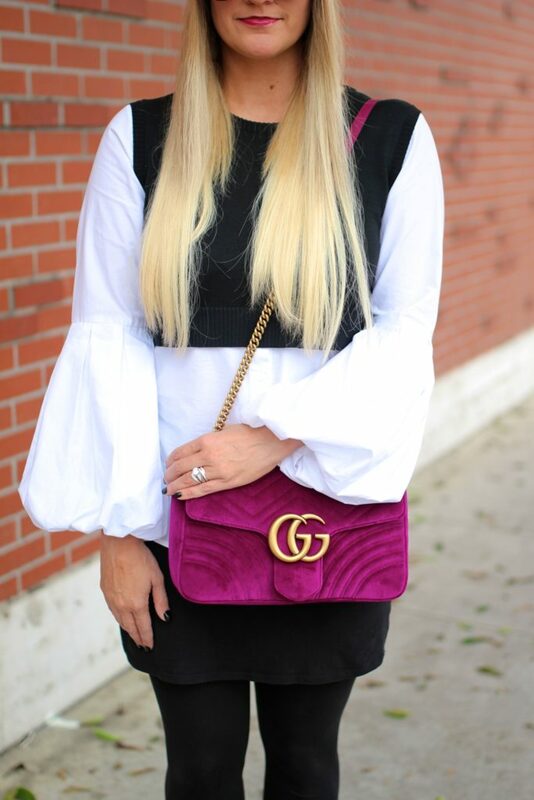 Black and white really makes a classic combination, and you accented it perfectly with that gorgeous Gucci marmont velvet bag. Really cute look dear.